School of Fish: Snow Adventures! Yesterday afternoon snow began to fall in Athens, GA. Ezra and I were excited to see the beautiful snow, and Ezra enjoyed eating snow, making snow angels, having snowball fights and jumping on the snowy trampoline. 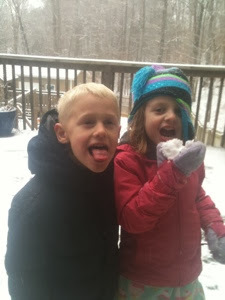 His friends all got out of school early yesterday and today, so he has had playmates for all of this snowy fun! The downside of this snow storm is that the Atlanta area is not equipped to handle 2" of snow since it happens so infrequently. Many highways are completely closed, so getting to the airport may be a bit of an adventure. I have been staying with our dear friends, the Irwins this past week. Chris has a 4-wheel drive truck and knows many alternate routes around Atlanta because he grew up in that area. So this afternoon, around 2:30-3:00, Chris will attempt to get us to the airport. And if you know Chris, you know that he intends to win. As of right now, British airways says that my flight might be slightly delayed and we should be departing Atlanta around 9:26pm. The stated arrival time in London leaves me less than a 1 hour layover in London before we get on another plane to Entebbe, Uganda. If that is the case, I will not have time to post an update until we land in Uganda. Thank you for all of your prayers for our safe travel. I will keep you updated as much as possible.